Some people have mentioned liking my code so I've decided to post it here. They're 100% free to use, but please don't remove credit, is all I ask. Also, you don't have to, but I'd love if you left a fave on the code if you use it, and of course I would love to see what you do with it. Modifications are welcome too! I will probably be updating the code as I go. Do follow my alt account at orchestrator to get notifications whenever I do so. If you'd like to support me, you can donate to my Ko-Fi or feel free to commission me for art! My default character profile code! I'll probably be updating this one regularly as I improve upon it. 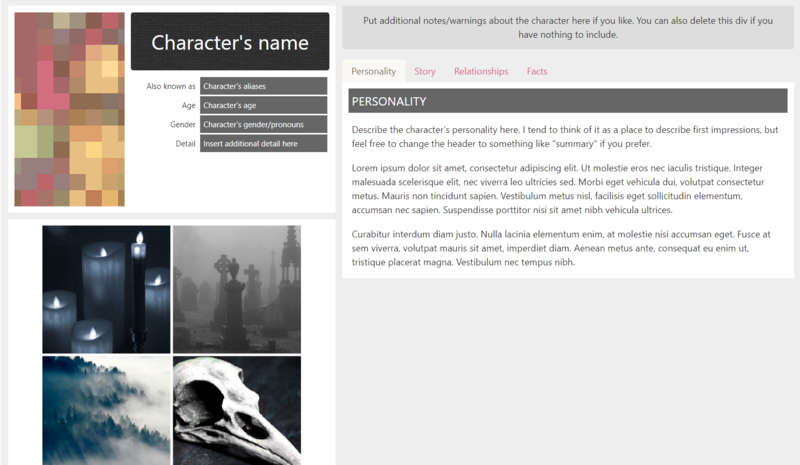 Mobile responsive, has tabs for character summary, relationships, and a character sheet/moodboard space. 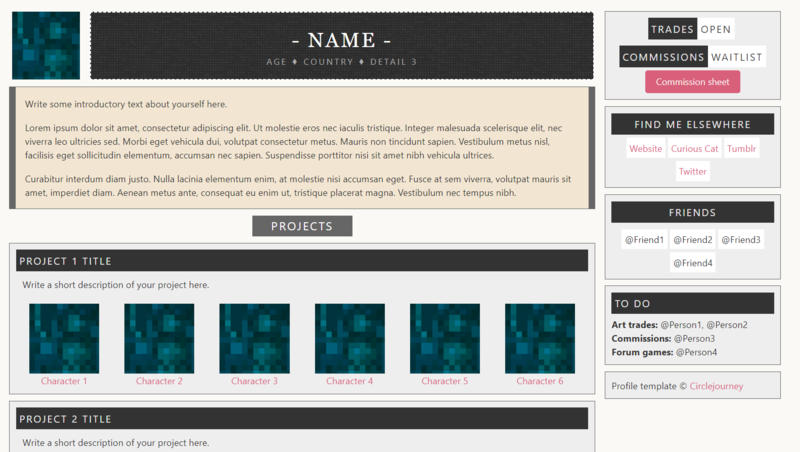 Adapted from my user profile code, this template is designed to showcase lots of different projects. Mobile responsive, organises profile into main area and sidebar. Based on my folder code, for organising a single large folder with a lot of characters. Includes links to projects/categories, and a tag list. 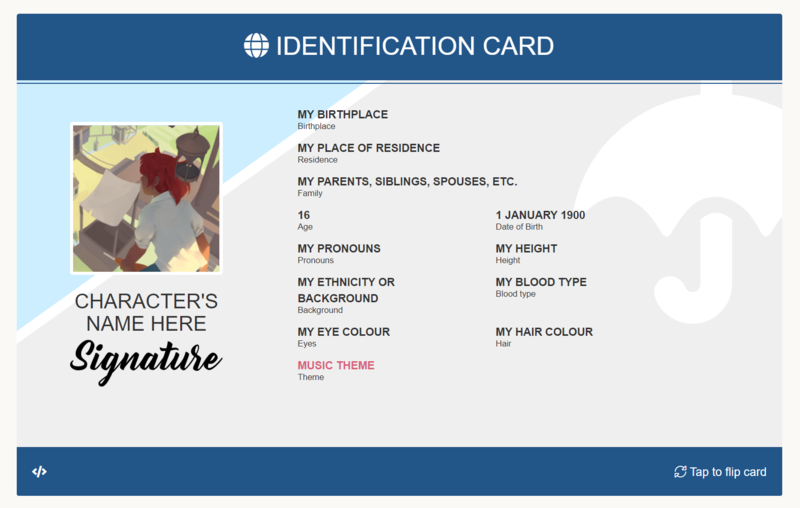 A character profile theme inspired by identification cards. Mobile responsive and interactive (flip the card! ), with a space for a signature (if you like) and background graphic. Based on my folder code, for organising a folder with a lot of characters. Includes links to projects/categories, and a tag list. Hi! I'm hoping I could get some help here... 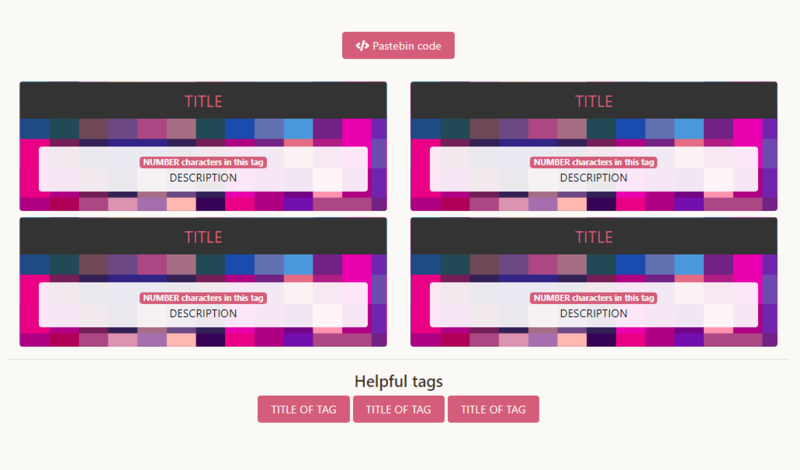 I'm having trouble making the tabs on your Cards code scrollable... Any tips? What I did was add, to each tab-pane element, the class name table-responsive, and the style property max-height: 500px; but it doesn't have to be 500px. I'm going to use these! Thanks! Thanks for letting us use these cool codes! I'm so in love with the cards which I'll probably throw into some profiles. Also thank you everyone who's left their compliments above. I'm thinking of opening customs sometime soon! Identity is a really good code!